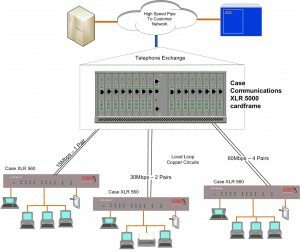 The Case Communications XLR 560 Series extends the reach of Ethernet services to remote sites by using fibre optic circuits and / or bonded copper pairs. Designed with standards-based EFM technology (2Base-TL), the XLR560 series allows service providers and enterprises to deliver Ethernet with symmetrical bandwidth at rates up to 60Mbps over Copper using TCPAM 128, and up to 200Mbps Over dual fibre ports. 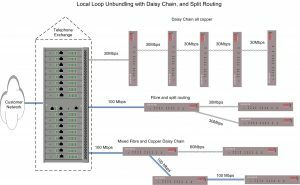 The XLR 560 is an extremely flexible product, and has the ability to be ‘daisy chained, or to have ‘split routing’ as can be seen from some of the application diagrams below. 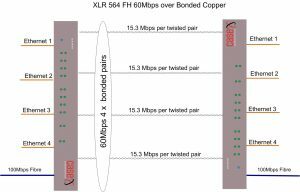 The diagram below shows the XLR 560FH Bridges running over Fibre links, to two remote sites. 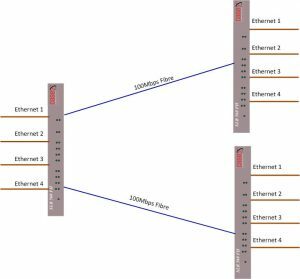 Using Single Mode Fibre Optic SFP’s distances of over 100Km can be achieved. 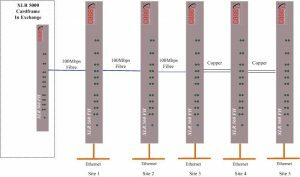 The XLR 560FH’s have the ability to ‘Daisy Chain / (Add Drop) up to 30 hops over both Fibre and copper circuits as shown below. 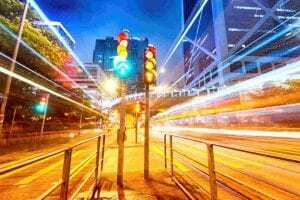 Service providers and Enterprises can offer symmetrical broadband connectivity for transparent Ethernet services, DSLAM backhaul, Wireless backhaul and other applications. By leveraging, existing copper services and using the unique EFM bonding technology, the XLR 560 can bond up to 4 pairs, and deliver up to 60Mbps of Ethernet to users within the service area. The XLR 560 operates mainly over a point-to-point configuration. It can be configured as either a COE or CPE device allowing one unit to operate in two modes. With a compact form factor and optimised for use over an existing copper network, the XLR 560 reduces the initial investment and deployment time in delivering higher speed Ethernet service. It provides low risk and a quick return on investment. The XLR 560 implements the IEEE 802.3ah standard and a vendor extended management features. It enables users to significantly reduce operating expenses as its based on standard Ethernet technology and it eliminates major technology upgrades. The XLR 560 is compatible with any standard Fast Ethernet interface from switches, routers, and SONET / SDH equipment. The fast Ethernet interface enables the XLR 560 to work as a smart Ethernet demarcation device as well, which is required between the customer interface (UNI) and provide separation between the carrier WAN and Enterprise LAN by monitoring network status and operation at the customers site. The XLR 560’s management includes a comprehensive command line interface (CLI), user friendly GUI-based web browser interface and SNMP and Telnet. The XLR 560 provides future-proof features meeting Ethernet Quality of Service (QOS) and Class of Service (CoS) requirements by utilising 802.1q VLAN and DSCP capabilities, stacked VLAN (Q-in-Q), four levels of priority, traffic flow control and rate control. The traffic management and QOS features enable services providers to offer value added services for minimal cost.